When it comes to dental care, you want the latest cutting edge technology to be used in your treatment. X-rays do provide valuable information when it comes to your dental health, but they don’t provide a complete view of everything that is going on inside your mouth. An intraoral camera can see every aspect of your teeth and mouth, uncovering cracked teeth, plaque deposits, excessive wear and cavities next to fillings. Catching these problems early on can mean less invasive treatments and spending less money on treatments. An intraoral camera is about the size of the mirror the dentist uses to help them see inside your mouth during a regular checkup. The camera displays the images it captures on a monitor for the dentist and patient to see. It is a great tool for people who want to be proactive about their dental health while also giving your dentist a clear picture of your teeth’s condition. The intraoral camera isn’t just a diagnostic tool, but it is also an educational tool as well. The average person cannot see into their mouth, so instead of dentists using diagrams and props to explain dental health conditions to their patients, they have the images captured by the camera. The intraoral camera allows patients to see exactly what is going on in their mouth and your dentist can pause the camera feed on problem areas to show patients specifics. It allows the patient to ask precise questions and to be an active part of the treatment process when your dentist is going over treatment plans. When your dentist can point out an exact spot where the tooth is decaying, it enables the patient to better understand their hygiene practices and techniques. Using the intraoral camera makes record keeping easy because it can take pictures of decay or the start of oral health conditions. The pictures that are taken can be printed and added to a patient’s file. Before this camera, dentists had to try and explain in words the problems they encountered when they examined a patient. 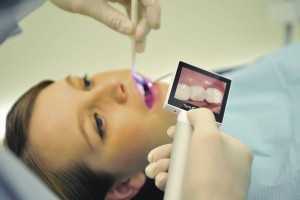 The dentist can also provide the patient with pictures for their own records as well.